Chief Scott Freitag began his emergency services career in 1993 as an EMT and Emergency Medical Dispatcher in St. Louis, MO. He attained his paramedic certification in 1994, and left a private EMS service for the St. Charles Fire Department in 1995. After 10 years with the City of St. Charles, he accepted a position as Assistant Chief of Operation for the Cottleville Fire Protection District where he served for 8 years. Freitag accepted the position of Fire Chief with the Chino Valley (Ariz.) Fire District in August of 2013. In July of 2014, he became the Chief of the Central Yavapai Fire District as well as Chino Valley Fire District under a Joint Management Agreement between the two agencies. As of July 1, 2016 the two organizations were blended to become the Central Arizona Fire and Medical Authority. 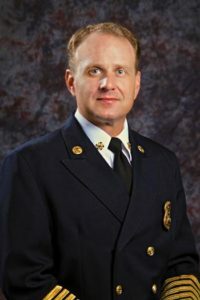 In addition to his emergency services career, Freitag has served as an adjunct professor for Lindenwood University in St. Charles, MO as well as Northern Arizona University. He has earned his Associate Degree in Fire Science, a Bachelor Degree in Mass Communications and a Master’s Degree in Business Administration. Freitag has completed the Executive Fire Officer Program (EFOP) through the National Fire Academy, and has earned his Chief Fire Officer (CFO) certification through the Center for Public Safety Excellence. He holds numerous other fire service certifications through both State and Federal agencies. Previous Post: Capt. Kevin Keith, Firefighter/Paramedic, Prescott Ariz. Fire Dept.